Govinda KC, a physician at the Tribhuvan University Institute of Medicine (IOM) in Kathmandu has a reputation for integrity and service, especially to underserved people not just in Nepal but all over the world. He is unmarried, lives frugally in the staff quarter at the Teaching Hospital and unlike most doctors in Nepal, doesn’t have a parallel private practice. Whenever disaster strikes in the country or any corner of the world, like the earthquake in Haiti or the tsunami in Southeast Asia, he packs his bags and flies off at his own expense to treat survivors. Last year, when the government tried to install a political appointee as the dean of IOM, Govinda KC went on hunger strike for two weeks until physician Prakash Sayami was appointed. It is a lucrative position since the institute has a direct say in inspections of existing private hospitals and also granting coveted affiliations to new medical colleges. Last month, Sayami rejected the affiliation application of four new teaching hospitals: National Medical College, People’s Dental College, Manmohan Medical College, and Nepal Police Medical College. Sayami, also a doctor known for his professionalism and integrity, rejected the applications on grounds that the new colleges did not meet the IOM’s criteria even though they had been approved by the institute’s designated inspectors. The corruption and rampant commercialisation in the medical sector has raised the price of healthcare in Nepal and affected the quality of treatment. There is also a far more dangerous and far-reaching impact: many of the doctors who graduate from these medical colleges just don’t have the quality of training in medicine and healthcare that is needed. And since students have to pay up to Rs 4 million fee just for admission into school, the practice feeds a vicious cycle of profiteering at the expense of the poor. After Sayami became dean, he expelled 20 MBBS second semester students who had failed their exams four times. Most of them were from the Janaki Medical College in Janakpur, which like other private medical colleges, has been investigated by the corruption watchdog, CIAA, for not meeting stipulated standards. Nepal’s 19 existing private medical colleges need an investment of at least Rs 10 billion each and by taking shortcuts, not keeping the required number of hospital beds, over-charging and providing deficient care, they can recoup their investment within a few years. Most existing and new hospitals have powerful backers, many have political protection from the four main political forces in the country. Most of the four new hospitals that applied for affiliation, for example, are said to be close to UML politicians. Sayami was sacked last month for rejecting the applications and this was probably because money had already exchanged hands for the affiliations. 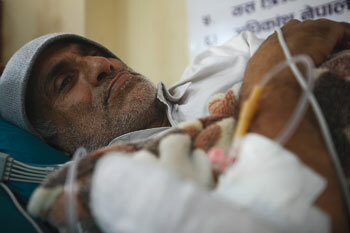 As soon as Sayami was forced out, Govinda KC once more went into hunger strike, saying the government, political parties, and Tribhuvan University were colluding to establish new teaching hospitals and cheat the public of affordable healthcare. KC has been on his fast-on-to-death for 13 days now and his condition is said to be deteriorating. The Chairman of the Interim Electoral Council, Khil Raj Regmi, visited the doctor on Wednesday and ordered Shashi Sharma, who succeeded Sayami, to step down. He has so far refused, apparently under pressure from IOM staffers. Sharma himself has a notorious reputation and is still under investigation for irregularities while he was in the Nepal Medical Council. In what appears to be a reprisal, IOM has refused to accept the resignation over this affair of Teaching Hospital Director Bhagwan Koirala, another doctor with a reputation for courageously standing up for integrity and good management. IOM has said it is also investigating Koirala on unspecified charges.